Cohortes evocatae consist of former legionnaires that have reenlisted, forming now a veteran corps within the army. They fight with high quality equipment like normal legionnaires, with a gladius and pila. Until very recently most veterans of the legions were settled down in Italia after their discharge. Here they can be found if their service is needed again. A Cohors Evocata consist of former legionnaires that have reenlisted, forming now a veteran corps within the army. They are liberated from the many routine duties of a normal soldier and their weapons and armour are of high quality. Besides an oval scutum, Evocati wear a suit of lorica hamata (chain mail), the new Coolus bronze helmet and two greaves for protection and are fighting like normal legionnaires with a gladius and pila. Historically, the Evocati were a privileged group of former legionnaires who volunteered to serve in the army again after being recalled by a general, sometimes years later. They were part of every important army and their number could reach several thousand if a famous and beloved former commander asked for his veterans. Evocati held a higher rank than the ordinary legionary and many of them even had their own horses. 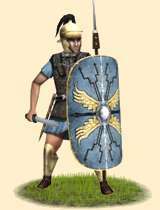 Often they were trusted with minor command duties and their chances for promotion to the rank of centurion were excellent. The problem of the late republic to find enough men who fulfilled the property requirements to serve as heavy infantry in the many and continuous wars the masters of the Mediterranean world now had to fight was one of the main reasons that reforms in the army had become inevitable. Earlier attempts to increase the number of suitable small farmers through land reforms by the Gracchi were blocked by senate, as many senators owned great latifundia now sprawling all over Italy. So all property requirements were given up and volunteers from all social classes were welcomed as well as the conscripts, while the state or their generals paid for their equipment. The senate had refused to bear the incalculable able costs for the veterans so that the generals had to take care of them. As a consequence a class of professional soldiers arose, men that had spent countless years in the field far away from urban civilization and the senate in Roma. With no qualifications other than martial skills, some of them remained soldiers their whole lives and reenlisted as evocati after their regular service. The loyalty of these men shifted more and more to charismatic leaders that they were now depending on, preparing the ground for many bloody civil wars of the 1st century BC.